As a local business, EPE Corporation recognizes that we can make the greatest impact in our community by supporting causes that are important to our neighbors right here in Manchester, New Hampshire. Whether it be through our charitable partners, our newly established 50 year Commemorative Community Campaign (EPE’s 50-CCC) or our individual employees’ volunteer efforts, we at EPE are aware of the importance of helping our community. Follow the links to find out more about our charitable partners who strive to make a positive difference in the lives of Manchester’s families and children and who have inspired us to give back. Provides coordinated support services to child victims of crime and their families. EPE’s President and CEO, James “JD” D. Bell, Jr. served on the Board of Directors for the Granite State Children’s Alliance from 2010 – 2015. EPE continues to support this worthwhile cause to help the children of New Hampshire. The Child Advocacy Center of Hillsborough County is a program of the Granite State Children’s Alliance with local Centers in Manchester and Nashua. The Centers’ goals are to aid in the successful prosecution of child abuse crimes, and to do so in a manner that begins the healing for victims. The Toys for Tots program unites members of local communities during the organization’s annual toy collection campaign. Toys are distributed as Christmas gifts to needy children in the community, with the goal of delivering a message of hope to less fortunate youngsters. Big Brothers Big Sisters seeks to change the lives of children (aged 6 to 18) facing adversity for the better, forever. The organization strengthens communities across the US, and helps children realize their potential and build their futures. Veterans Count, a program of Easter Seals, was conceived in 2007 and brings comprehensive, emergency aid to veterans and their families whose quality of life was significantly impacted by deployment to war zones. Since 2010, EPE has been a proud supporter and contributor to the Veterans Count program. To achnowledge our 50 years in business, EPE has created a campaign which is designed to assist and support a variety of local community organizations and groups and to make a positive impact in our area. This campaign will acknowledge our past support of community related events and groups as well as look forward to new ways to help the community in which we work and live. This year’s campaign includes, but is not limited to, a back pack & school supply drive for a local elementary school, a Veteran’s Day fundraiser for local vets and a Toys for Tots donation drive in December. EPE is extremely proud that many of our employees pursue their own individual, community-driven, volunteer and/or fundraising activities in various causes that are important to them, such as STEM programs, school-related programs, drug awareness and treatment, cancer fundraising etc. EPE encourages and supports these employee-driven endeavors and recognizes them as an integral part of strengthening our community. George & Kerry are at it again! Both run their personal best in the Chicago Marathon for the Cystic Fibrosis Foundation. With the help of donors, an EPE raffle and hard work to earn the money, George and Kerry exceeded their fundraising goal of $2500! 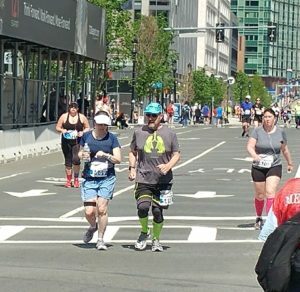 In May, George Sheldon and his daughter, Kerri, pictured above, ran a half-marathon at the “Run to Remember” event in Boston, held yearly in honor all fallen hero 1st responders, Police, Fire and Emergency Service members from primarily Massachusetts but also from around the country. The proceeds from this race benefit multiple children’s services in Boston and throughout Massachusetts. 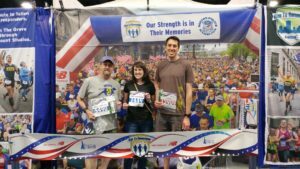 The “Run to Remember” finisher’s photo of George, his daughter, Kerri and George’s son-in-law. George Sheldon, left, and his daughter run in the Trick or Trot 3K to help raise money for CHAD. Nice work! Donna Guthro, pictured left, created and donated this awesome piece of stained glass art to the Manchester Animal Shelter’s Wine and Chocolate event on October 22nd. Proceeds from this event will be used to provide daily and medical care for stray and abandoned animals in Manchester. 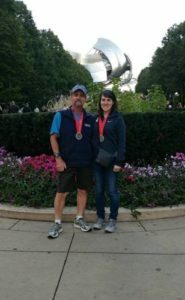 George Sheldon, with his daughter, pictured left, wants to thank the EPE employees who supported them and their fellow “Team Boomer” Runners in the Chicago Marathon on Oct.9th! George and “Team Boomer” medaled in the marathon! All of the proceeds collected from the marathon goes directly to promote research for a cure for Cystic Fibrosis. Participating in the Insane Inflatable 5K Relay Race are EPE employees Roberta Feder (second from left) and John Burke (far right). Also pictured is Roberta’s friend, Tammi (far left) and John’s wife Debbie and granddaughter Chantal. This event, held earlier this month in Salem, benefitted the American Cancer Society’s Relay for Life. Nice work! Below are EPE Employees Sharon Ferguson, Deb Noble and Jean Neely (with daughters etc) who participated in the Mudderella event to raise money to fight domestic violence against women. Great job, ladies! Donna Guthro donating platelets at the Red Cross. Way to go, Donna! Tracey Bell volunteers for BeBOLD, a drug awareness and prevention group.